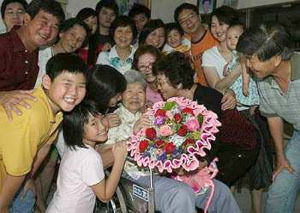 Joyous reunion: Teo surrounded by her children, grandchildren and great-grandchildren at her Yong Peng house. YONG PENG: Matriarch Teo Guat Kwee has reason to be smiling this Mother’s Day as she finds herself surrounded by many of her loving children, grandchildren and great grandchildren. The celebration is extra special because a wedding reception in the family last night allowed 89-year-old Teo’s family to turn the weekend into a joyous reunion. Clutching a bouquet from her children, Teo was a picture of happiness at her home in Yong Peng. One of Teo’s daughters, Wong Ee Teng, 46, said the family celebrated Mother’s Day annually but decided to make this a grander affair as many of her relatives were around. Ee Teng said that her mother, although not a strict disciplinarian, taught her family the value of determination, education and thrift. Reminiscing with laughter, Ee Teng said that when she and her siblings were growing up, they would often show Teo their latest purchases of clothes and shoes. Teo would gently admonish them saying, ‘Money won’t bite you, you can save some of it’, shared Ee Teng, with a chuckle as her sisters nodded with amusement. Ee Teng said before her mother became wheelchair-bound a couple of years ago, Teo was fastidious about keeping herself fit for as long as she could. Another daughter, Ai Ngee said that her mother continued to tap rubber trees in their plantation until the age of 65, as she preferred to keep the work within the family.